Four days after gaining worldwide attention as perhaps the biggest python on the planet, the international spectacle has died. 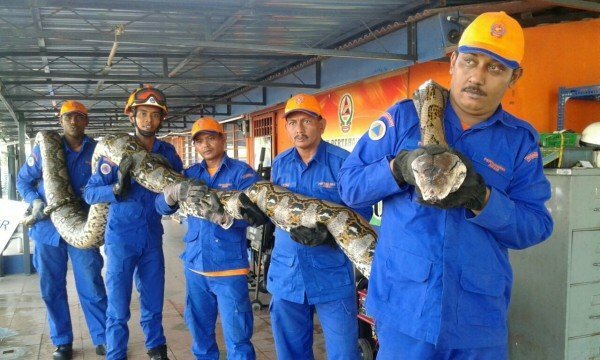 Officials with the Malaysia Civil Defense Department, which was holding the giant python after it was discovered at a construction site, say the bohemoth died while laying an egg. The stressful situation may have lead to complications, they admit. Others have suggested the python was the victim of abuse or physical harm suffered during her capture. A video posted to the Malaysia Star website briefly shows a man kicking the snake and a noose around the snake’s neck to restrain it. The snake, which was originally thought to be 8 meters long, was in fact 7.5 meters, falling just short of the Guinness World Record held by a snake named Medusa, currently in a Kansas City haunted house. The particular breed of snake is a reticulated python found mostly in south-east Asia and considered the longest reptile species on earth. The one caught this week is the longest and largest ever caught by the department on Penang Island, according to Civil Defense team operations chief Herme Herisyam. next articleChasing Turkeys: On Choosing a Shotgun or Bow?